This year, the Home Builder’s Association of Greater Chattanooga is hosting its 49th Annual Tri-State Home Show from March 13-15 at the Chattanooga Convention Center. One of the many past Tri-State Home Shows. “If you are planning to build or remodel your home a trip to the Home Show is the perfect place to start. You’ll see, touch, and experience the most beautiful landscaping, kitchen, windows, remodeling and building services available in our area and get expert advice on how to being your new home or remodel. With over 470 booths there’s everything to make your house a dream home. Come be inspired!” – Tri State Home Show website. The best part about this show is that Outdoor Lighting Perspectives of Chattanooga will be there! We will have a booth set up where we will be answering questions, showing off our new products, and signing people up for free nighttime demonstrations. · Many fixtures now available in “bronzed.” Come see the difference! Also, talk to us about the best warranties in the business and our latest technology to protect your LED lighting system from power surges. 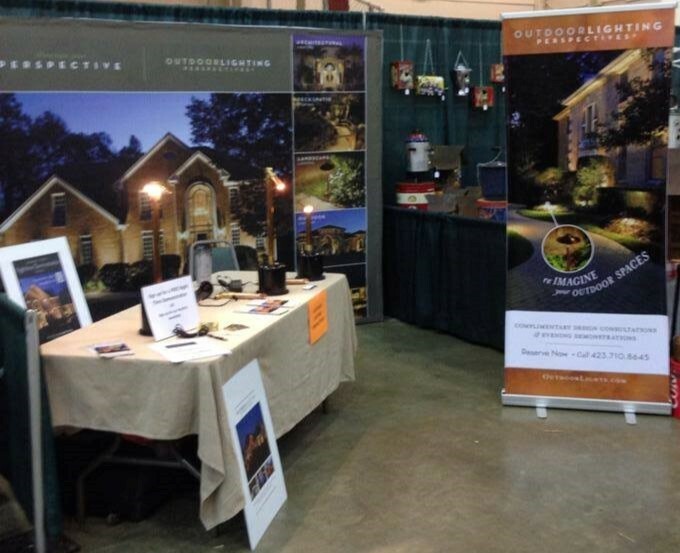 Outdoor Lighting Perspectives’s booth at a previous convention. Friday, March 13 and Saturday, March 14 10:00 a.m. – 8:00 p.m.
Sunday, March 15 11:00 a.m. – 5:00 p.m. Admission is $7 for adults and is free for children under 16 years of age. Seniors can receive $2 off admission on Friday and anyone can save a dollar if they bring in a canned food to benefit the Chattanooga Area Food Bank (discounts cannot be combined). Mark your calendars! We look forward to seeing you March 13-15 at the Chattanooga Convention Center. Out in the country, just south of Chattanooga, a client called us for lighting on their country home. This home of one year is located in Dalton, Georgia and sits on several acres of land with a small private lake and even a small vineyard. The clients are wine enthusiasts and have their own wine bar and cellar in their basement. They called Outdoor Lighting Perspectives of Chattanooga to create nighttime curb appeal, highlight the architectural features of their home, provide some light for outdoor living spaces and illuminate their American flag. The home had many architectural features to highlight. Beautifully stacked stone with majestic wooden gables and trusses were among the most prominent. One challenge was the concrete patio at the base of the house wouldn’t allow for “up” lighting the home. The only option seemed to be flooding the house with spot lights resulting in washing out the texture of the stone and allowing light to shine into the windows. It took a lot of creativity, but the up lighting effect turned out beautifully. So, we had to get creative. We performed “surgery” on the concrete to discretely run wire to the base of the columns and placed fixtures in some medium sized planters with rosemary plants. A task that seemed impossible before was now vividly beautiful. Finally we used high powered LED fixtures to display the moving American flag from two different perspectives. The stonework of this beautiful Dalton home can now be appreciated day and night. 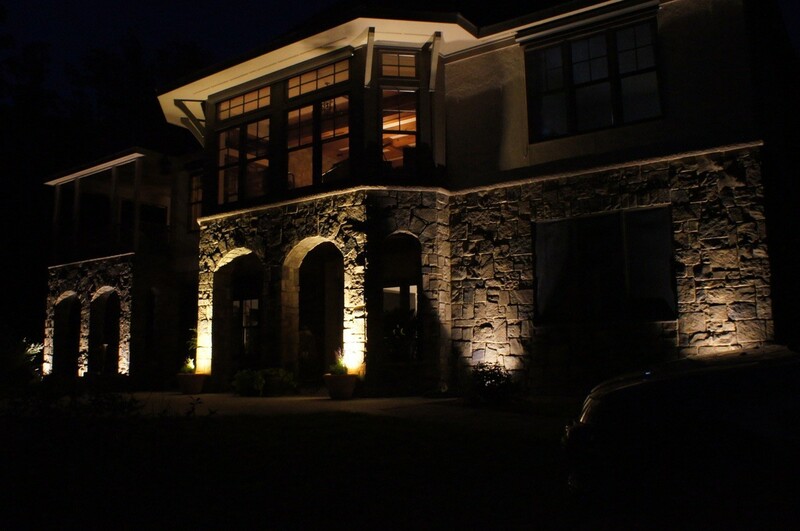 For creative lighting ideas on your home or outdoor living space, call Outdoor Lighting Perspectives at 423.710.8645. Welcome back to “Project Lookout Mountain Fairyland Club”. In part 1 we discussed lighting the turret, ball room, chimney and mountain stone. In part 2 we will discuss highlighting the landscaping, boulders and walkways. 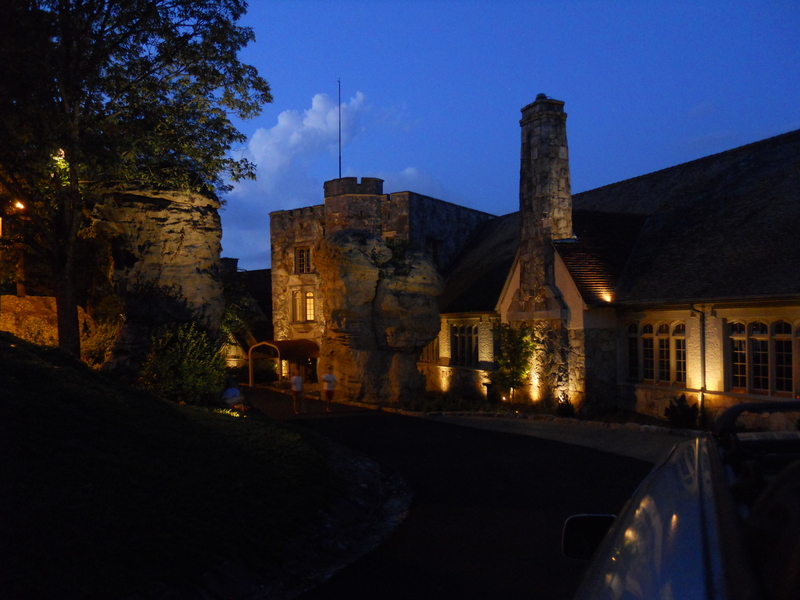 The Club Manager wanted us to shed gentle light on the walkways, highlight huge boulders that are prominent on the property and illuminate some of the natural landscaping. We started with cool and subtle moon lights spilling light from the trees high above. They splashed gentle light on the rhododendrons, ferns and annuals. 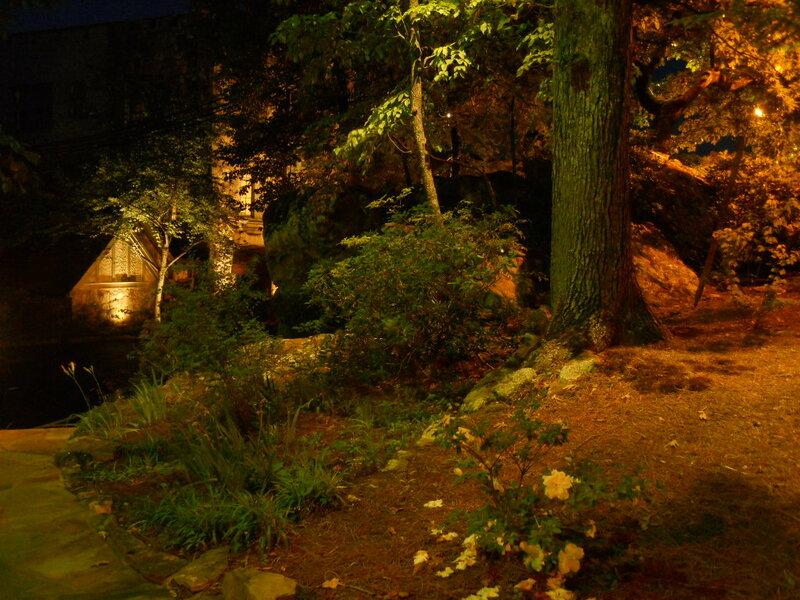 Lighting on the grounds at the Lookout Mountain Fairyland Club. We used high output LED fixtures in the trees to make a moonlight effect. It created interesting shadows and helped to illuminate the landscaping such as ferns and azaleas. 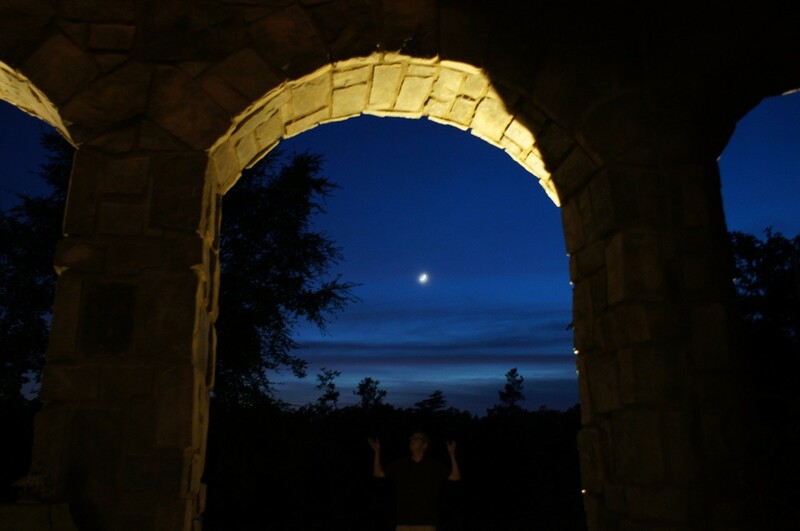 The moon lights served two purposes; one illuminate the landscaping, yet also providing gentle light on the walkways from the historic building to the parking lots. Finally, Outdoor lighting Perspectives tucked away hidden flood lights with 10 watt LEDs to highlight the numerous boulders including the famous “Twin Sisters”. Lookout Mountain Fairyland Club member says “I’ve been a member here for years, I had no idea how beautiful this property could look at night”. Thanks for the great review, Bob! The Lookout Mountain Fairyland Club sits on top of Lookout Mountain, GA overlooking Chattanooga , TN. At ninety years old this English Tudor Revival style building made of local mountain stone underwent a major refurbishment. As a part of the 2014 update, general manager Bob Guth asked Outdoor Lighting Perspectives of Chattanooga (OLP) to help update the exterior’s nighttime curb appeal and safety. Part 1 will discuss the lighting project on the building. Stay tuned for Part 2 which will discuss the landscaping, boulders and walkway project. The club manager wanted to highlight the architectural features of the old building. This included the turret over the main entrance, the Grand Ballroom and the beautiful mountain stone with which the building is constructed. OLP designed and installed a series of tiny LED lights made from copper and brass to compliment the building’s existing copper features. They were installed at various architectural breaks along the foundation of the building adding interest and character to the once dark and overlooked building. High powered LEDs were used at the turret to reach the top of the third story and cast shadows among the stone window trim. 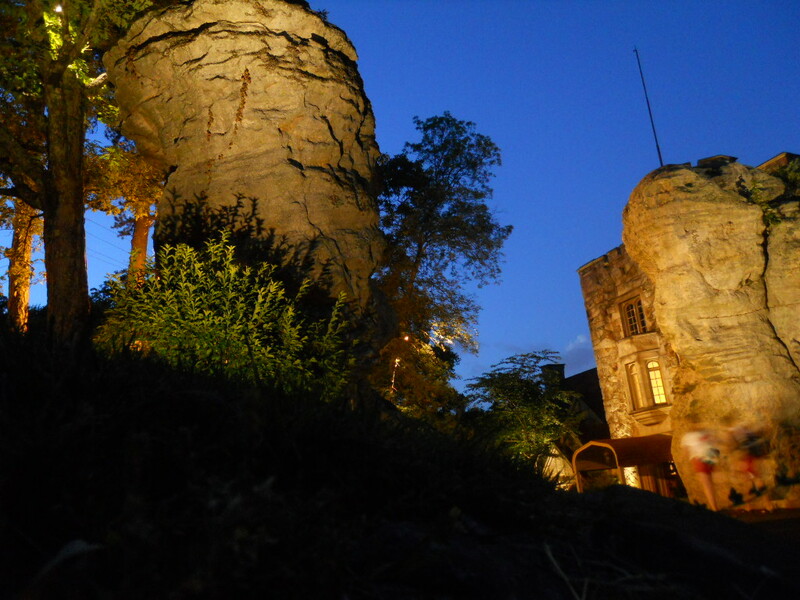 Spot lighting lights up a turret while up lighting emphasizes the beautiful landscaping around the Fairyland Club. Secondly, copper gutter lights were installed to feature the stone chimney as well as spot lights from the ground. Finally, extra wide flood LEDs we nestled inside to bushes for discrete lighting across the Grand Ballroom. 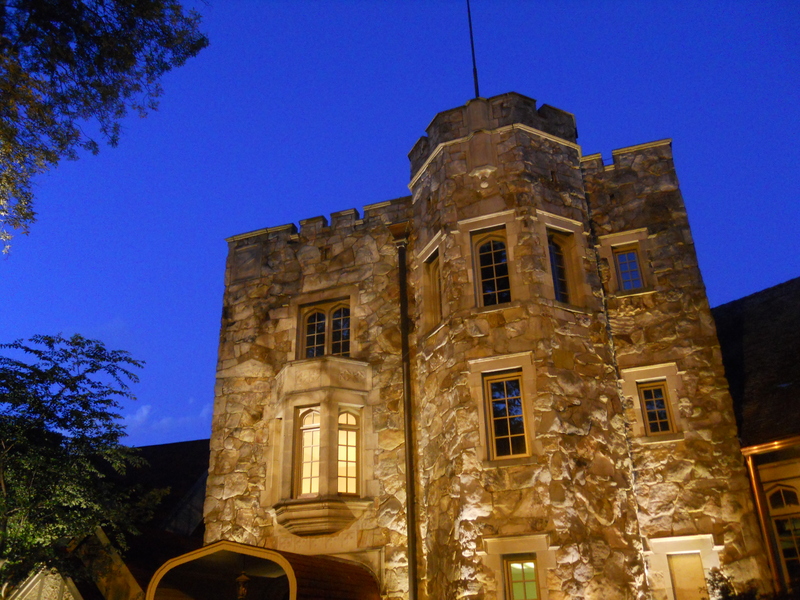 “The outdoor lighting really adds that beautiful final touch to our overall renovation,” said Bob Guth, General Manager of the Lookout Mountain Fairyland Club. Check back for Part 2 to hear about the landscaping grounds and the “twin sisters”.